As you know, I'm not a "believer." I am a logical person — I only believe in things that can be logically proven. But I was just interested: Why do you always write "G‑d"? We do not write G‑d's name in a place where it may be discarded or erased. Treating G‑d's name with reverence is a way to give respect to G‑d. So even though on a computer the name is not really being erased (and perhaps is not really there in the first place), and "G‑d" is only an English term used to translate G‑d's holy name, it is in keeping with this respect that I write "G‑d" in my emails and on-line articles. I guess I shouldn't expect any better. No matter how smart a computer is, certain things are beyond it. How would you program a computer to have respect for G‑d's name? It is unreasonable to ask a computer to relate to G‑d, because G‑d is not a logical concept — He created intellect, and He cannot be captured by His own creation. A computer is limited to logic, so it can't handle spiritual concepts. Just as a metal-detector will beep when a gun is passed through it, but it cannot pick up a person's thoughts or intentions, intellect can grasp logic and rationale, but it cannot detect the Divine. But a human is not a computer. Intellect is not where we begin and end. We have a soul that is beyond intellect, and our soul detects G‑d because our soul sees G‑d. Jewish faith is about getting in touch with the soul that knows G‑d already, without needing any proof. This is not negating intellect — it is transcending it. How do you get in touch with your soul? Ask G‑d. He'll tell you. Why Pray If Everything G-d Does Is Good? Hi! I may not be of Jewish belief (a Catholic, actually. Prior to my marriage, I was a Pentecostal), but your article touched me really deep. It might seem... a nitpick, to others. But as G-d had told Christians through the Bible, we can only be trusted with major things only if we can be trusted with the smaller things. Including, how we treat G-d's name in our writings, even on a medium as fleeting as the Internet, where a small mistake can send myriads of articles into oblivion. You have inspired me, Rabbi Moss. I will commit myself to the gist of this article: Never utter (or write) G-d's name in vain. It is nice to have a 'call to action' at the end of your answer.... but could you perhaps add an edit with some historical time period when this practise was first adopted? Maybe it was always done this way anyhow with Hebrew centuries ago, and people adopting more 'expllicit' languages didn't want to spell it out so plainly? If the name of G-d has power -- only from the tongues of those who've practised correctly, with diligence, and Divine blessing -- then that same power is its own protection. A classic responsum concerning the words for Gd in French specifically cautioned against including any French words for "Lrd" or "Gd" in, for example, letters to friends and kin, out of concern that the letter might wind up "on a dung heap." I have forgotten how many centuries ago this Responsum was, only that the major sage of that era counselled this practice and it has been customary among many or most observant Jews ever since. I see every reason to continue this centuries-old practice. Anything posted on the internet is subject to the whims of anyone who cares to print it out and then doesn't bother to keep it and doesn't know what else to do with it but to trash it. Omit the hyphen. Just type a capital G and a lower case d, without a hyphen. I do not understand, Brian. 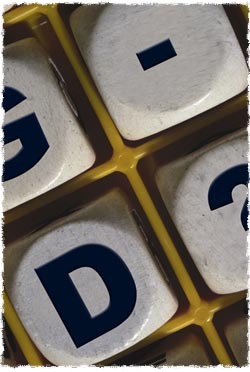 When I read text with G followed by d, I am not distracted. It's normal to me. In any case, I'm not going to provide readers with the opportunity to print out what I've written and flush it down the toilet. The thought is disgusting. But I need not worry about that, because I don't write anything sacred. The prayer book and the Bible spells it out, of course. It's great for the question and answer. Maybe Rebeca only refers to the fact that computes are incapable of emotions such as "respect." Maybe someday. But not with the current type of wiring. Actually, we do not even know if our own brain wiring can experience respect. Maybe it is our soul, rather than our wiring, which experiences respect. Maybe we really are, as was formerly asked, "a ghost in a machine." Not that the soul is a ghost. We have a soul, a spirit, and a nefesh. But let's not go there. The computer has no soul, no spirit, and not even a nefesh, and it cannot feel respect. Please receive the following with my deepest respect. The prophet Moses received the two tablets containing the Ten Words from God. They were the workmanship of God (Exodus 31:18; 32:16). When he came down from the mountain, he saw the people of Israel engaged in idolatry. Moses, in righteous indignation, threw the two tablets to the ground. They contained God's personal holy name, as represented by the Tetragrammaton (YHWH) and His other holy descriptive titles. The broken pieces of the tablets were kept in the ARK along with the two new tablets. We have seen this comment before, but I prefer to add "Gd" as a word. The point is to omit the vowel, so I think we should really omit it, rather than signal it with the hyphen.